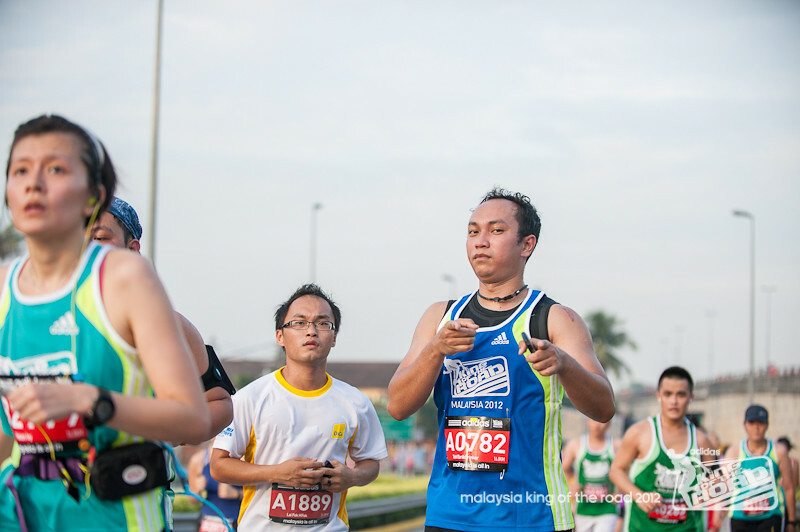 Since the start of Ramadhan and 2 weeks within the Hari Raya celebrations, I have to admit that I have been slacking A LOT on my running training and it suddenly hits me that at I am due to seriously hectic running schedule all the way until the end of the year. 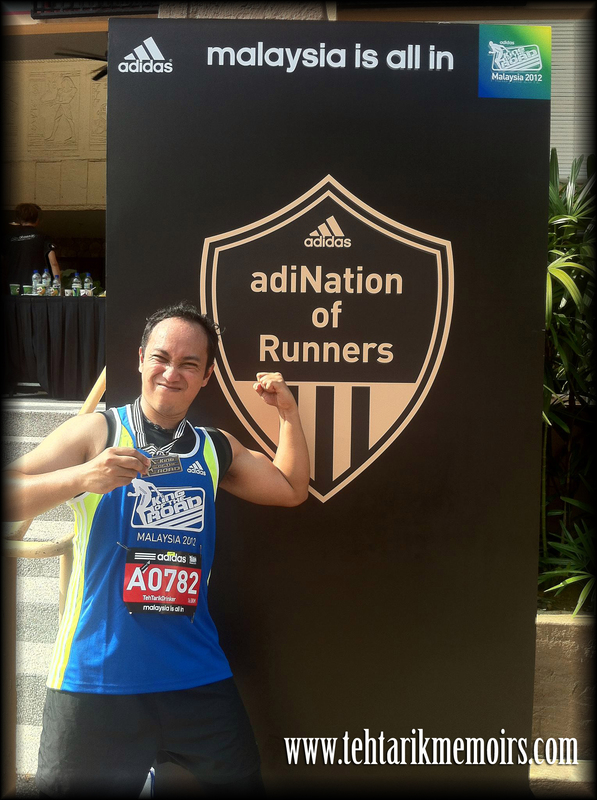 So restarting again on my running routine, the Adidas King of the Road 2012 was one I was looking forward to for many weeks now. Unfortunately, this was my Murphy's Law run. For those of you who don't already know this, Murphy's Law identifies a situation that everything that can go wrong, will go wrong and I was told that every single runner will experience this at least once within their running career. 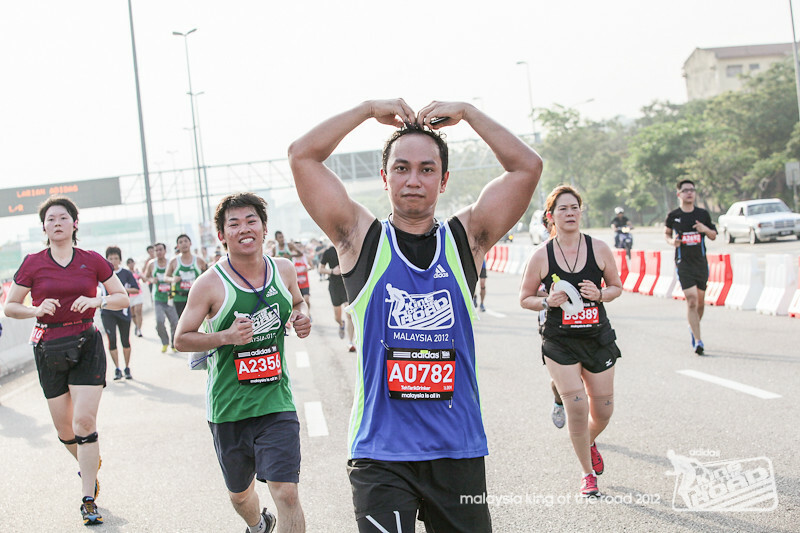 Everything seems to go wrong for me before the run during prep time and even in between the run which made me lost my timing for the entire run. 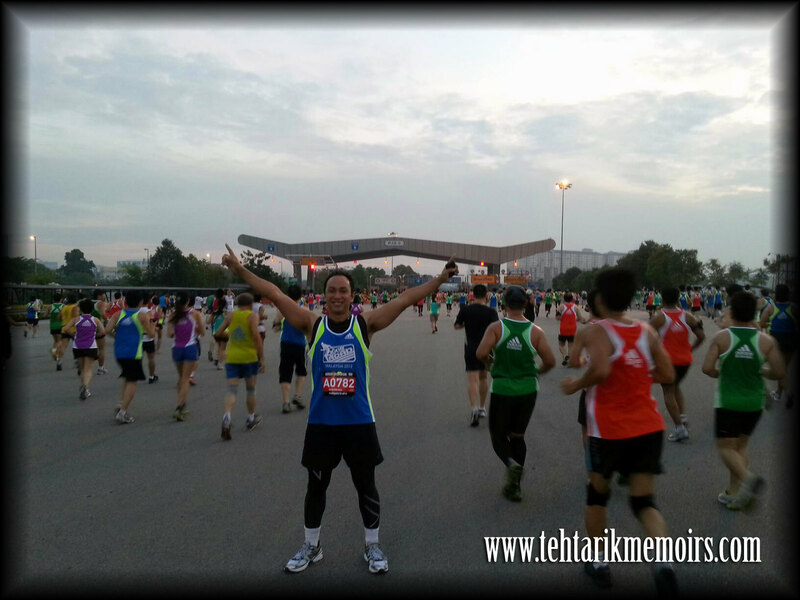 Me and the rest of the Teh Tarik Runners were up bright and early for the event and arrived in time for an early stretch and warm up. However this is where it got ugly. I woke with with the worst nose block you can ever imagine which completely derails my entire breathing strategy for the run. 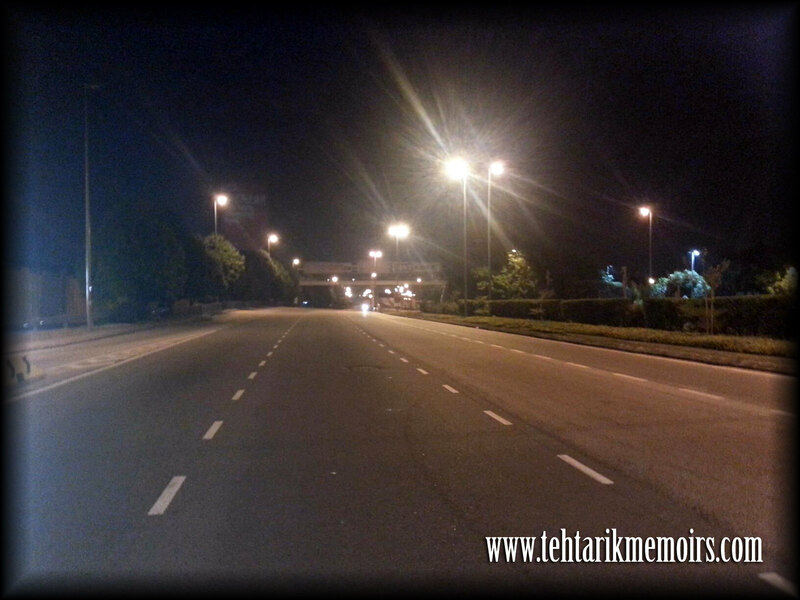 Still I was adamant in completing the run so I decided to walk around and get my breathing regulated. 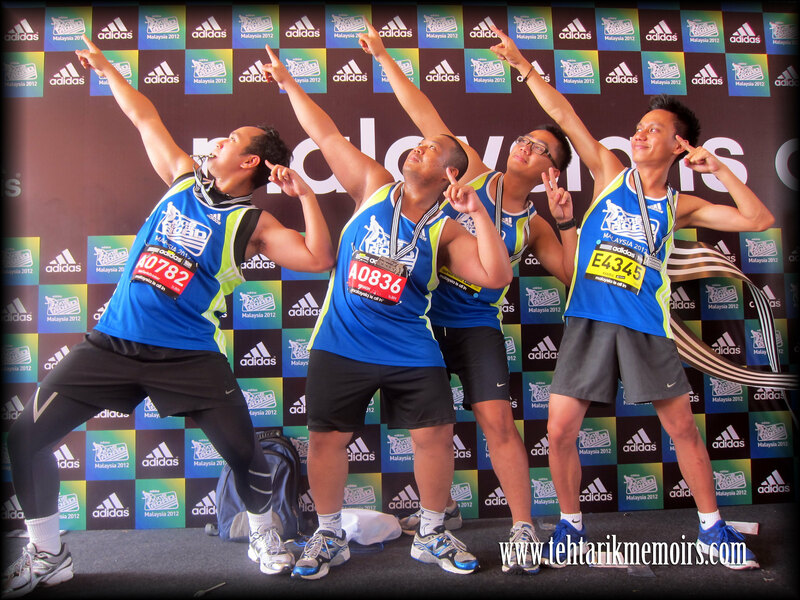 Since that Teh Tarik Runners this time is separated, with me and Ash running the 16.8 run and Clance with his brother is running the 10km run to look at girls, I shuffled in the starting line with Ash. Once again lady luck decided to take a day off with me as my headphones decided to "kong out" right before the start of the race. That means, no motivation music during the run, no coaching kilometer-by-kilometer from Endomondo, nothing. Just me running and desperately keeping my focus with everything that is going on. At the start, we whisked our way through the crowd easily. Unfortunately I didn'y have my running belt with me either so no hope of taking pictures while I was running or even a place for me to put my phone which was tracking my mileage. Fortunately Ash was there to take pictures with his Samsung S3 which turned out great! Kilometer 3, we had our first water station. 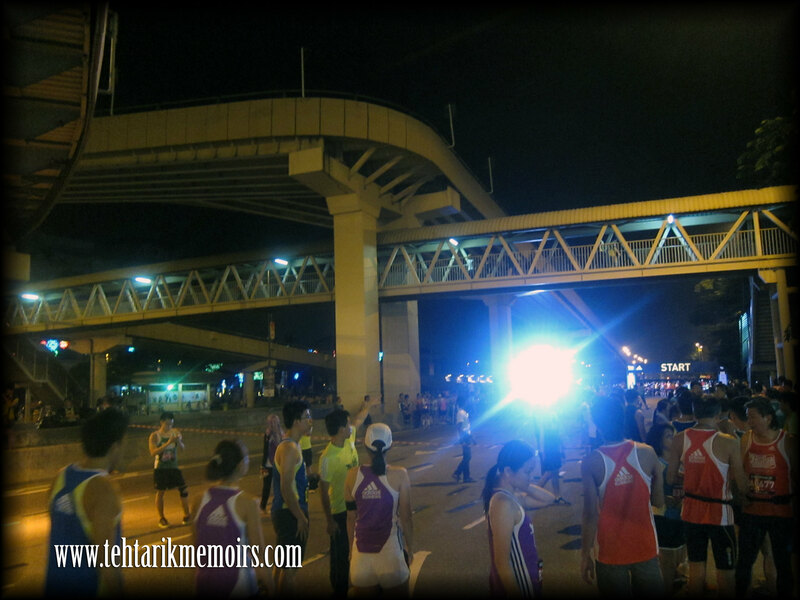 I have to admit everything so far was very well organized which gave ample room for all runners to recover properly. However we saw over the yonder was the first incline we had to tackle. 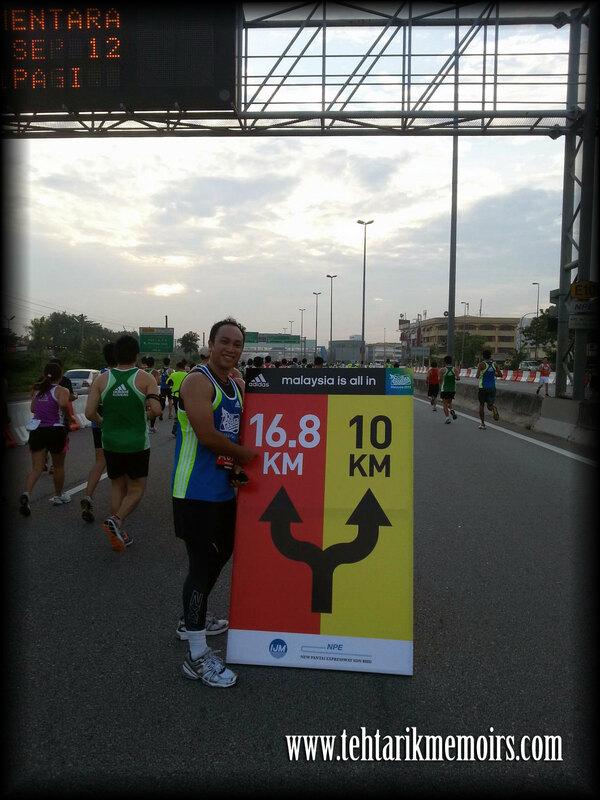 Kilometer 7, we had our first split for the 16.8km runners and 10km runners. Couldn't resist on snapping a picture here. Kilometer 9 was the point we had our in pass turn and I was already spotting a lot of familiar faces on the other side of the road. Unfortunately as we were running by, a girl tripped on herself and fell quite badly on the road. Me and Ash decided to help and ran forward to call for medical help. If she is reading this, I do hope nothing bad happened apart from the scratches I can see on her hands and knees. Kilometer 11, we were basically on the home stretch but I was slowing down a lot. Although my strength to run was still there, my ankles and breathing started to play up a lot so I was generally walking gingerly on the trail from this on. 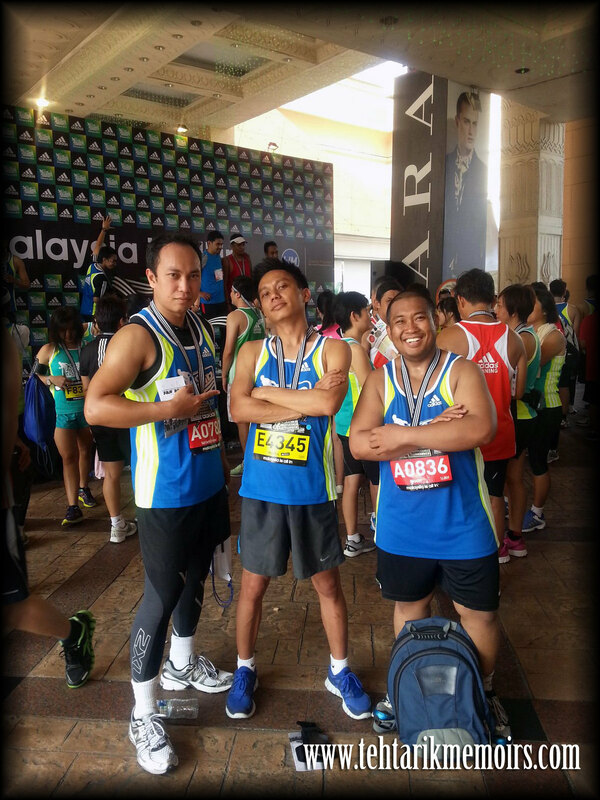 Kilometer 13, I got separated from Ash who was also facing a lot of problems with his thighs. 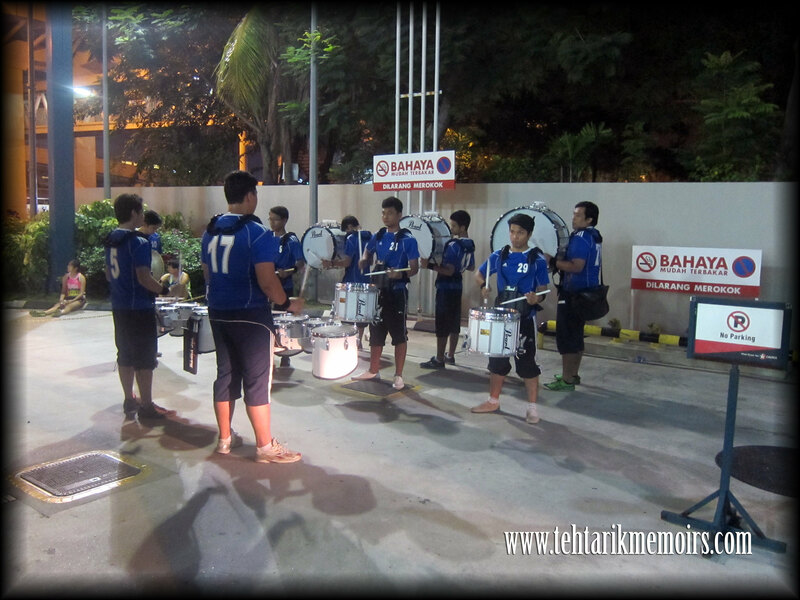 I passed the last watering station on this marker and was welcomed by a group of kompang playing cheer squad. Gave them a clap of appreciation and high fived one of them for good luck. 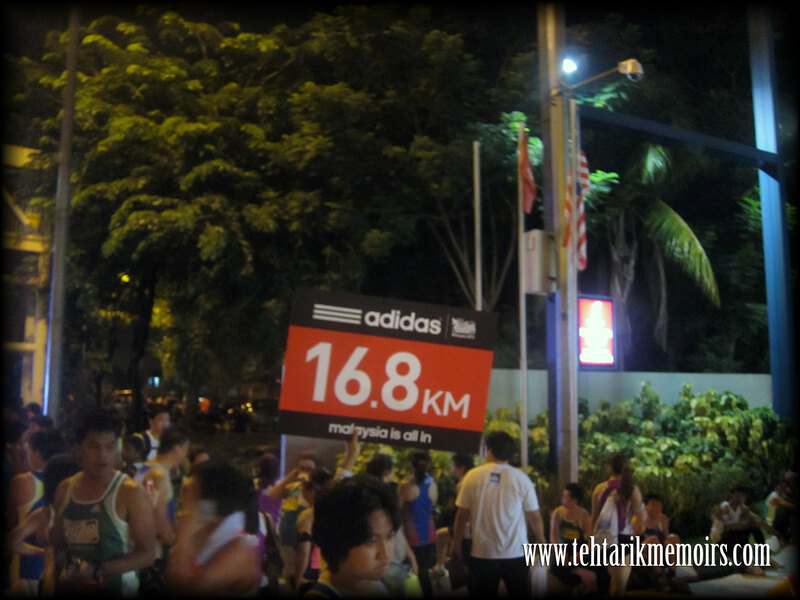 Kilometer 16, I literally walked to this marker. I could barely breath from here on and my stomach was now rumbling on to full glory. But I had this uncle who came chatting with me for a bit and said there was less than 500 meters to the finish line and ask we finish it together. With everything that went wrong, I opened up the taps and gave it everything. This triggered the cramps, that shifting feeling within your calves but I kept going. And I finally did it in 2:10:32! This was an extremely disappointing timing but I do feel its an achievement nevertheless with everything that has happened to me that day. A canceled trip, blocked nose and fever, stomach problems, ruined headphones, accident happening in front of me and rusty injuries, I still managed to finished a race I was looking forward to with flying colors. All in all, I was generally happy with the organization of the entire event itself. Despite the 10,000 people joining the race, there was not one instance that the organizers lost control of the crowd which was a good thing. One bit to complain is I wish there would be more booths visible to sell the merchandise of the event which I was more than happy to buy to be honest. Hence, there was only one thing left to be done. 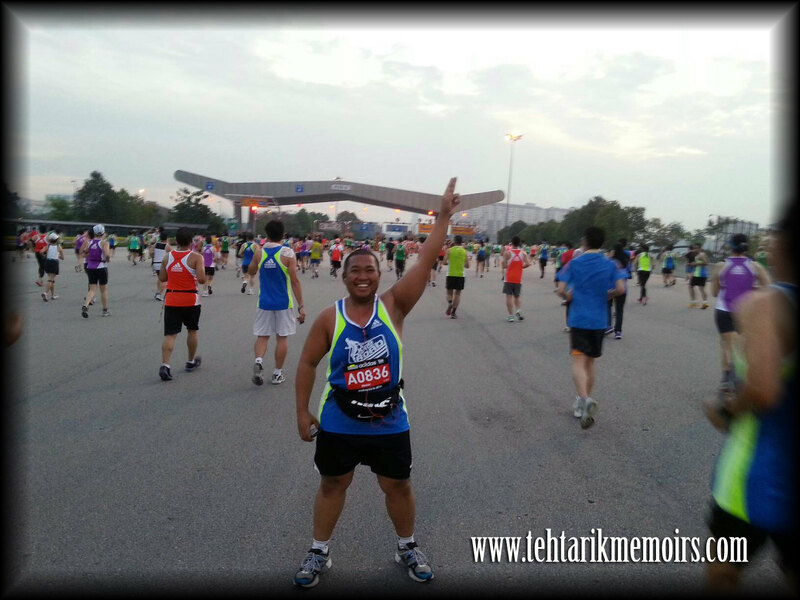 Next weekend, Taiping International Marathon. BRING IT ON! Glad it all went well despite the technical issues!